Pulling out, cutting, finished – the wall-mounted roll holder Parat Royal in elegant stainless steel appearance cuts aluminium foils and cling films neat and precise with its razor-sharp special blades, without time-consuming rummaging in the drawer, without picked edges and without fiddling on the cling film because the foil end is not found. After the cutting the foil ends are again ready to hand and can easily be cut. The razor-sharp blades are hidden behind the ergonomic shaped cutter, free from the risk of injury. 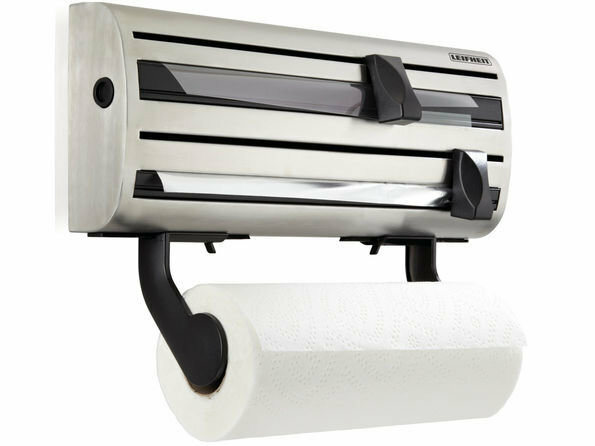 The wall-mounted roll holder Parat Royal offers space for three rolls: behind the matt casing of stainless steel aluminium foil and cling film are hidden. A third holder is prevented for kitchen rolls. After the assembly the wall-mounted roll holder can be stored from the front wall easily and comfortable. Remove the stainless steel container, put the roll in and the Leifheit wall-mounted roll holder Parat Royal is ready for use. It is suitable for all commercial roll sizes (not contained in the quality delivered).